It's the most wonderful game of the year! Holidays filled with gifts, candy, friends, and good cheer will put a smile on everyone's face. Bring them all together and mix them up to create some unforgettable memories with the game that's never the same twice! It all begins with one basic rule: Draw one card, Play one card. You start with a hand of three cards... add the card you drew to your hand, and then choose one card to play, following the directions written on your chosen card. As cards are drawn and played from the deck, the rules of the game change from how many cards are drawn, played or even how many cards you can hold at the end of your turn. Basically, fluxx is a card game where the rules can change throughout the game. The goal of the game is to match what is on the goal card, but be weary, the goal card is constantly changing… players place “keeper” cards which are used to fulfill goal cards and declare victory. But watch out, some Fluxx games feature “Creeper” cards which can infect your play area and prevent you from winning (these cards are NOT found in HOLIDAY FLUXX). Players can play new rules which can drastically change the game or can play action cards or surprise cards to effect the game play as well. basically, the game starts with a draw 1 and play 1 rule but can quickly change as there are “new rules” cards which vary from specific rules to increasing draw and play amounts, and there is even a play all rule which forces players to play every card they have (this usually leads to a faster game depending on the draw rule). Overall, this game can get a little crazy, as all fluxx games can, but is easier to learn than some of the other fluxx games, even though they are all relatively easy to learn. Fluxx, in general, isnt a very long game and is great for short to medium game sessions. This version of fluxx has no creepers so the game generally goes even faster than some of the other Fluxxs. That being said I would recommend this as a good intro to tabletop gaming, especially for people who are into the Holidays but are hesitant to play, or for casual/family gamers. Holiday Fluxx definitely focuses most heavily on the end of the year Holidays like Christmas and Thanksgiving but has some easter eggs in the mix (gaming pun intended). theres also a promo card for Holiday fluxx you might still be able to find some places. Check online. Dont forget to check out other fluxx games. From Monster Fluxx to wizard of Oz fluxx to Zombie Fluxx to Cthulhu fluxx to just the original basic fluxx theres a lot of fluxx to be played! Fluxx is a game that comes in many flavors. From Sci-fi to Cartoon and now “HOLIDAY FLUXX”. This version is the favorite version of one of our players because it doesn’t have “Creepers”. These are hated. 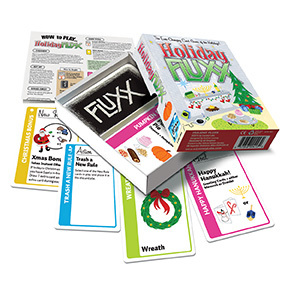 Holiday Fluxx covers most of the major holidays but centers on Christmas and Thanksgiving. It is a quick playing game and fun to laugh about. Any game about holidays should be an easy game to bring new players into the gaming life stile and this is no exception. P.S. I can’t think of many games that are Holiday themed. Add a Review for "Holiday Fluxx"